Last month, after stops in Colorado Springs and Grand Junction, MiLB.com's Ben Hill completed his #BenEverywhere goal of having visited all 159 active affiliated Minor League Baseball ballparks. He's visited 172 Minor League ballparks overall, many of them multiple times. This marks the fourth in a series of "Ben's Best" articles, in which Hill recaps his favorite people, places and things from his many seasons of professional travel. 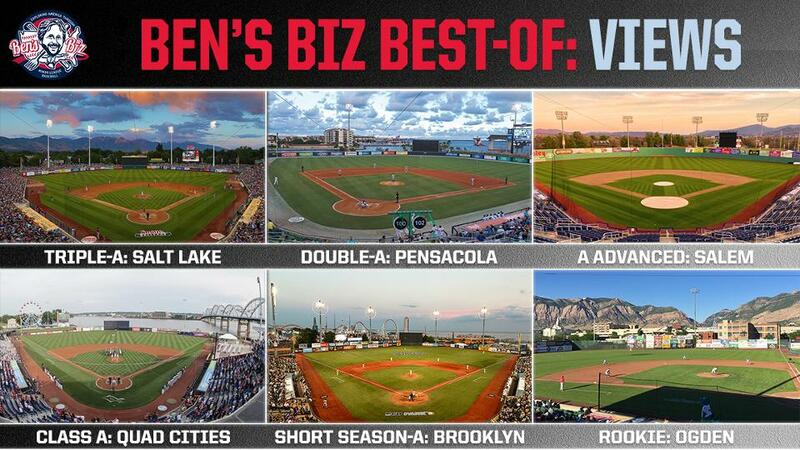 In the first installment of this "Ben's Best" article series, I listed my favorite ballparks in the Minors. This edition focuses on just one -- albeit vitally important -- judging criteria: the view. From rugged mountain landscapes to glistening city skylines, Minor League stadiums offer a wide variety of scenic and often truly stunning surroundings. What follows is a level-by-level look at my favorites. The Salt Lake City metropolitan area is home to over 1.1 million people, making it one of the larger markets in Minor League Baseball. Yet there's nothing urban about the view at Smith's Ballpark, which spotlights the breathtaking beauty of Utah's Wasatch Mountain range. This glorious backdrop, running on a jagged but ultimately downward slope from left field to right, is at its best when illuminated by the setting sun. Pensacola, located in the far west portion of the Florida panhandle, is a waterfront city. It makes sense, then, that the Blue Wahoos would play in a waterfront ballpark. Pensacola Bay is located just beyond the facility, and beyond the bay lies the Gulf of Mexico. The proximity to this aquatic expanse contributes greatly to Blue Wahoos Stadium's breezy, hospitable atmosphere. The Blue Ridge Mountains, which encompass approximately 35,000 square miles, run through eight Eastern states. These mountains form a rolling backdrop for Salem Memorial Ballpark, home of the Red Sox. The view is most impressive beyond right field, where the elevation spikes dramatically and the mountains seem to double up upon themselves. Modern Woodmen Park's proximity to the Mississippi River makes it prone to the occasional flood, but this liability is more than counterbalanced by its picturesque tableau. The Centennial Bridge -- spanning the Mississippi between the River Bandits' home of Davenport, Iowa, and Rock Island, Illinois, -- is clearly visible from the right field side of the ballpark; it offers a particularly endearing view at night, when its five rolling arches light up the sky. The bridge view is complemented on the left side by an outfield concourse Ferris wheel, which was added to the ballpark in 2014. Coney Island in the summertime is a riot of colors and character, and MCU Park's backdrop perfectly captures its essence. The Cyclone -- the iconic rollercoaster that inspired the Cyclones team name -- can be seen beyond the left field foul pole. But the Cyclone is dwarfed by other Luna Park amusement rides; for example, fans in the stands can watch Thunderbolt riders ascend from beyond the batter's eye before making a precipitous 90-degree vertical plunge. The Parachute Drop, a defunct ride, towers above the right field foul pole and is lit up colorfully at night. Looming beyond it all is the beach and, finally, the seemingly endlessly expanse of the Atlantic Ocean. This article began with the Wasatch Range, and now it ends with the Wasatch Range. As with Salt Lake City's Smith Ballpark, Ogden's Lindquist Field showcases spectacular -- although more intimate -- mountain views. Malan's Peak towers beyond center field, serving as the ultimate batter's eye. In left is Ben Lomond Peak, which is alleged to have provided the inspiration for the Paramount Pictures logo.